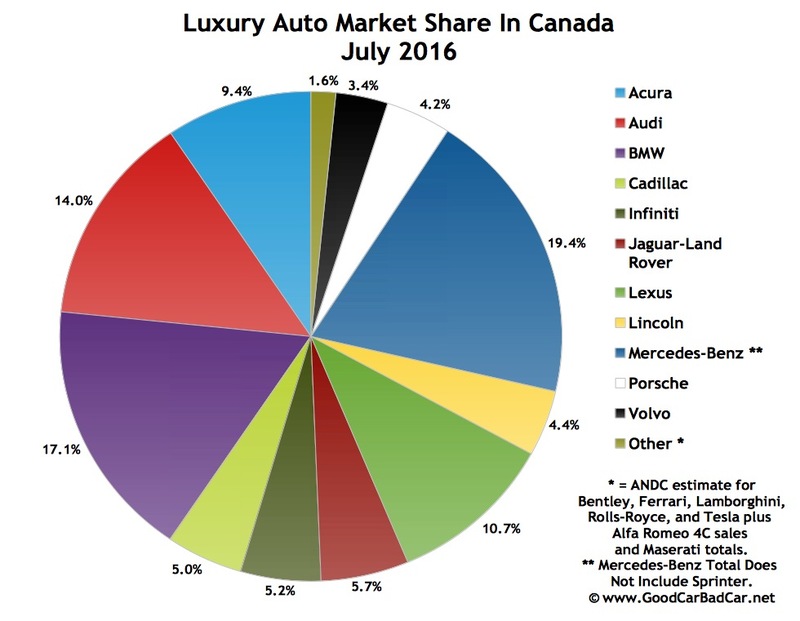 The Mercedes-Benz C-Class’s 17% increase to 888 sales was more than sufficient for the best-selling premium brand car in Canada to end July as Canada’s top-selling premium brand vehicle overall. In fact, even if C-Class sales growth was suspended, the C-Class’s 761-unit total from July 2015 was more than enough to fend off a challenge from the Acura RDX. 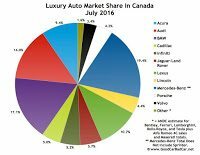 The C-Class was one of only five passenger cars on the list of Canada’s 15 best-selling premium brand vehicles in July 2016. Two of the others are direct C-Class rivals from BMW and Audi. Two more, the Audi A3 and Mercedes-Benz CLA, operate one rung down the ladder. Among vehicles with price tags above $50,000, July’s 10 favourites were all SUVs/crossovers. Only one car, the Mercedes-Benz E-Class (and its CLS-Class offshoot) cracked the top 15. For the purposes of the above list, premium brands include Acura, Audi, BMW, Cadillac, Infiniti, Jaguar, Land Rover, Lexus, Lincoln, Mercedes-Benz, Porsche, and Volvo. Brands like Aston Martin, Ferrari, Lamborghini, and Lotus don’t report specific monthly sales data. Maserati only reports brand totals. Buick has been excluded with a bunch of other automakers that don’t sell vehicles with base prices higher than $45K.